Most people who suffer from high levels of lead in their blood were exposed to the toxic substance at work, the Centers for Disease Control and Prevention says. The construction, manufacturing and mining industries account for most occupational exposure to lead. The data from the Centers of Disease Control and Prevention indicate that federal safety agencies need to focus on reducing this risk. Researchers analyzed cases from the agency’s Adult Blood Lead Epidemiology and Surveillance Program between 2002 and 2011. Approximately 11,536 adults were diagnosed as having very high blood lead levels. High blood level is a concentration that is greater or equal to 40 micrograms of lead per deciliter of blood. Of these cases, approximately 7,076 were linked to occupational exposure to high quantities of lead at work. The Centers of Disease Control and Prevention considers a level to be elevated if it is greater than 10 micrograms of lead per deciliter of blood. More than half of the cases of occupational exposure were linked to the manufacturing industry, with battery manufacturing, nonferrous metal production processing, foundries and fabricated metal products manufacturing heading the list. Within the construction sector, painters and wall covering contactors, workers in bridge construction and site progression contractors accounted for the highest number of cases. Other workers at high risk for exposure included those in remediation services, amusement and recreational industries, automotive repair and maintenance, mining, renovation, remodeling and painting. 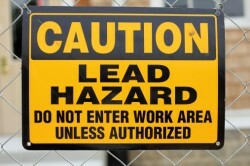 Exposure to lead is dangerous because of the resulting health problems. High levels of lead in the blood are linked to decreased renal function, a higher risk for hypertension and tremors. There also may be effects on reproductive health. Persistently high lead levels can result in lower sperm counts, spontaneous abortion, low birth weight, neurocognitive problems and anemia. Workers can reduce their exposure by changing their clothes and shoes after being in an environment containing high quantities of lead or using lead-based products. Changing clothes and shoes reduces the chances workers will face continued exposure at home to lead on their clothes and shoes. Workplaces where employees use lead-based products should be well ventilated, and workers should receive personal protection equipment to prevent direct contact with lead. Employers should conduct frequent testing to measure blood lead levels for workers. The CDC encourages workers who are concerned about lead exposure on the job to request a free work environment assessment.